What History in your Community is Worth Saving? Congratulations to the 4th and 7th grade grand prize winners of the 2018 Save Texas History Essay Contest! The Save Texas History Essay Contest encourages 4th and 7th grade students to answer an important question: "What history in your community is worth saving?" 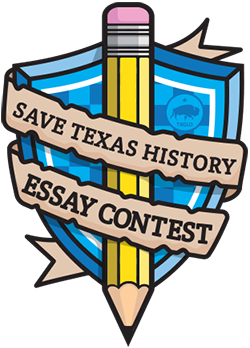 What: Save Texas History Essay Contest. Answer the question, ""What history in your community is worth saving?" When: Contest Starts September 1. Entries must be postmarked by November 14, 2018. Winners will be announced November 20, 2018. Where: Across Texas and in YOUR community. Why: Teach students about the importance of Texas history across the state, and in their own community. The winning entries will each receive a cash award of $500 courtesy of Chris Cantu of Edward Jones Investments and Bob Eskridge of Just in Time Staffing, both from Round Rock. Grand Prize winners will also receive Texas flags that have flown over the Texas State Capitol. Five additional finalists in each grade will receive $100 courtesy of the Rotary Club of Austin and the Sons of the Republic of Texas, and a Texas flag that has flown over the northernmost point of the Republic of Texas (in present-day Wyoming). All winners and finalists will also receive Save Texas History backpacks and a replica of an historic map from the GLO Archives map collection, and a Certificate of Achievement signed by Commissioner Bush.